 ‘D & S Posi-Coat’; Bio-based photo coating for sensitizing Lithography Stones and Plates and for Intaglio Photo-Resist applications (Copper, Zinc, Aluminum). Our manufacturing partners for the D & S Bio-products are U.S. FLUIDS.COM.  Graphic Chemical and Ink Co.
Century Plates are available directly from CSPogue Gaphics. Contact dwight@cspoguegraphics.com. NEW! BIO-BASED HARD GROUND FOR ETCHING PLATES! In 2009 retired printing plate engineer Skip Klepacki began collaboration with artist-printmaker- professor Dwight Pogue with the goal of promoting fine art printmaking using healthier petroleum-free, sustainable, bio-based and biodegradable materials. They developed a system of products that met their criteria for the highest possible print quality, improved health and safety in the studio, and environmental sustainability without increasing per-use costs. They offer the ‘D & S’ system of bio-based products at cost in order to bring these healthier and more sustainable technologies to printmakers everywhere. 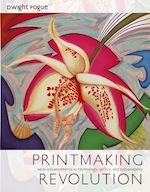 Printmaking Revolution, by Dwight Pogue, is a studio textbook written specifically for college and university printmaking students to enable them to fully embrace the latest, sustainable, petroleum-free and biodegradable materials that comply with EPA and OSHA requirements without sacrificing the most subtle qualities of fine art prints. These materials perform as well or better than the hazardous materials they replace, and actually cost less in the studio because expensive hazardous material shipping charges and costly disposal fees are eliminated. Printmaking Revolution also introduces revolutionary and as yet unpublished techniques for lithography, intaglio and screenprinting, so that the student printmaker can easily and safely produce more technically professional prints. Several noted master printers have generously contributed their personal techniques. Numerous photographs accompany easy-to-follow steps for safely combining digital technology with traditional printmaking, introducing new and exciting advancements for students and professionals alike. Lithography on stone: bio friendly vs petro-nasty. A side-by-side comparison of traditional petroleum based processing materials versus the new biodegradable processing materials. Hand drawn image on lithography stone is processed on one side with traditional chemistry and the other side with safer biodegradable chemistry. Works equally well on ball grained lithography plates. 2016 SGCI Portland Demo Preview—Green Technologies and Tips for High-Quality Petroleum-Free Lithography and Intaglio. --Low-cost DIY etching set-ups for copper, aluminum, zinc, and steel plates using rechargeable batteries andsafe electrolytes. --New ‘Precision Roller Bar’ retrofit system for direct litho presses enables printing of intaglio and lithographswithout changeover. --Multiple-use aluminum ‘Century Plates’ enable many colors/editions using one plate processed with bio-friendly materials. --‘Add-A-Tad’ high-definition photo coating for adding digital images onto intaglio and litho plates and stones. -- Gum Deletion Drawing techniques for printing lithographs. Renowned artist-illustrator Barry Moser draws on a Century Plate to produce a four color separation lithograph in collaboration with author and artist-printmaker Dwight Pogue, and emerging artist-printmakers Lauren Bennett, Kate Conlon, and Andrew Maurer. This is a simple method of making full color lithographs using all hand drawing and no photo processes. A system for printing quality lithographs on an etching press. The use of an offset printing blanket and thin uhmw plastic sheets provides wider latitude for setting pressure on etching presses than when using felt blankets. The use of register pins permits precise registration for multiple plate printing. For Graphic Chemical: https://www.graphicchemical.com/Default.asp. Item Number is 30163. For Renaissance: http://www.printmaking-materials.com/products/default.aspx. Item Number is 2323. UHMW Film: http://www.mcmaster.com/#uhmw-polyethylene-film/=qw4gx5. We used 24” wide x 36” (3 feet) long in 0.020” thickness. Polycarbonate (Lexan) sheets: http://www.mcmaster.com/#polycarbonate-sheets/=qw4iss. We used 24” x 36” x 1/16” thick. It’s also available in other standard sizes and thicknesses. If used offset blankets are not available, brand new 4-Ply Compressible Offset Blankets can be purchased at any size for $0.13-0.15 per square inch plus shipping from http://jaycoinc.com. Specify “Premium Blue Straight Cut”. Orders are usually shipped within 3-4 days. An excellent source for many other supplies and equipment for the printer. (one new two sided sanding sponge from hardware stores can be used to grain about 20 plates)! Dwight has discovered after working with many Century Plates this year that for photo coating, they may be grained using only BarKeepers Friend, water and a 3M Fine sanding sponge! No more BonAmi, no more carborundum grits (except for graining the very first time when the plate is new.) Watch this new video to see how it's done! Copyright (c) 2019 cspoguegraphics.com. All rights reserved.